Overhead apportionment is the process of apportioning general overhead between cost centers or departments. This overhead apportionment calculator can be used to apportion eight types of overhead, each with its own apportionment base, between six cost centers. If you need further information on the calculation of overhead apportionment, this is more fully discussed in our cost apportionment of general overhead tutorial. 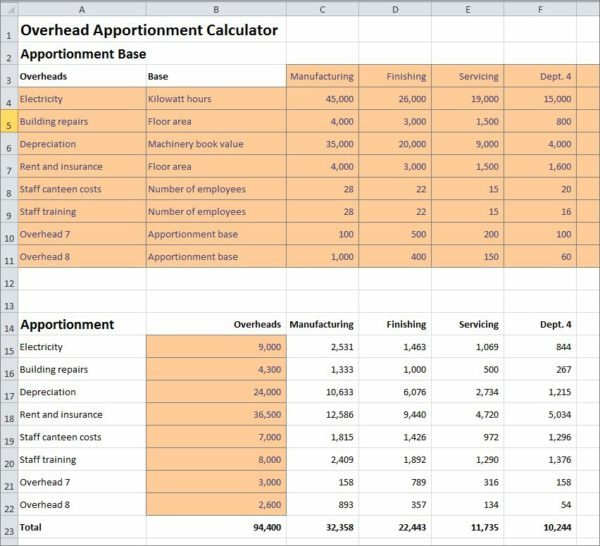 The Excel overhead apportionment calculator, available for download below, is used by entering the amount and apportionment base details for each of eight overhead types. The calculator then apportions the overhead over six cost centers. Enter the names of up to six departments or cost centers over which overhead is to be apportioned. For example, manufacturing, servicing, stores department etc. For each of up to eight overhead types enter details of the overhead name (e.g. staff canteen costs), the apportionment base (e.g. number of employees), and the quantity of the base for each of the cost centers (e.g. manufacturing 28 employees, servicing department 15 employees etc). The overhead apportionment calculator will total each base quantity. If an overhead line is not being used leave the information details blank, and enter zero for each cost center base quantity. For each type of overhead enter the amount to be apportioned for the accounting period. The calculator will then use the amount entered and apportion it between the cost centers using the appropriate apportionment base. For example, if staff canteen costs of 7,000 are apportioned to a department which has a 28 employees out of a total of 108 employees, then the amount apportioned is 7,000 x 28 / 108 = 1,815. Further details of overhead apportionment calculations can be found in our cost apportionment of general overhead tutorial. The overhead apportionment calculator spreadsheet is available for download in Excel format by following the link below. The overhead apportionment calculator is one of many financial calculators used in bookkeeping and accounting, discover another at the links below. Users use this overhead apportionment calculator at their own risk. We make no warranty or representation as to its accuracy and we are covered by the terms of our legal disclaimer, which you are deemed to have read. This is an example of a cost apportioning calculator that you might use when considering how to determine overhead apportionment. It is purely illustrative. This is not intended to reflect general standards or targets for any particular business, company or sector. If you do spot a mistake in this cost allocation calculator, please let us know and we will try to fix it.